This is a free week to come along and try out groupfitness classes at cityfitness. Starting August 11, ending August 17. 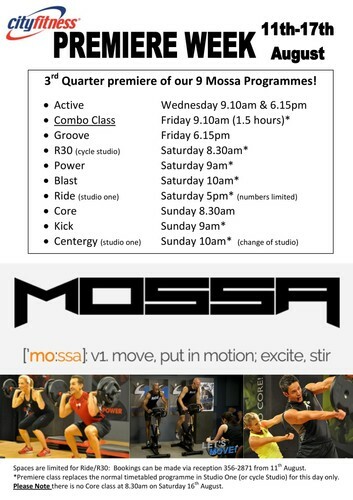 Made by Mossa and developed for anyone from the first timer to the advanced athlete, a range of different programs that utilise weight training, martial arts, dance, cycling, yoga and much more, with 30 and 60 min programs, there's something for everyone. Also there's the opportunity to talk to the instructors and learn more about the programs and the benefits of each program.